As it began to rain whilst they were finishing the painting yesterday, Clare and Andrew had placed the garden chairs under the wisteria arbour. This morning, Aaron carried them to the patio. The day was overcast. Jackie and Aaron spent the morning on garden maintenance, now at its most pressing. Aaron also filled his truck with our pruning and clippings. From the patio I continued on a perambulation with the camera. I took my usual route along the Kitchen Path, passing the rose campion planted in front of the lysimachia firecracker with feverfew to the left. taking a rest on the Westbrook Arbour bench, and looking down the Phantom Path to sculpture Florence. Penny Lane is making her way up the Gothic Arch, opposite clematis Star of India. 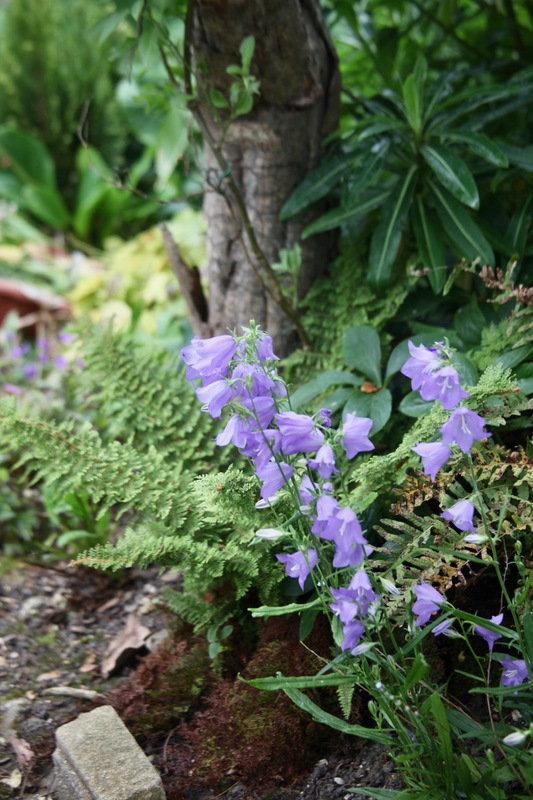 The campanula Persiciflora stands at the south end of the Brick Path, beneath the dead snake bark maple. It normally takes me quite a while to make inroads into a new book. “Pilling Always Pays’, by Thomas Armstrong, which I finished today, was no exception. My post-operative lethargy probably contributed to this, but I did also think that the author’s painstakingly thorough method of introducing his cast of characters may have played a part. Nevertheless, I will not hold this against him, for he proceeded to tell a carefully crafted story with numerous apparently disparate strands skilfully knitted together in the final pages. The setting was a provincial town in 1936, with its closely interwoven upwardly mobile community. In ‘Auntie Ivy And Sir Edmund Hillary’ I featured what I had found inside my copy. This evening we dined on succulent roast chicken, new potatoes, crunchy carrots and cabbage, and moist ratatouille, with flavoursome gravy. This entry was posted in Uncategorized and tagged begonias, campanula Persiciflora, cosmos, garden furniture, geraniums, marigolds, paths, Penny Lane, petunias, Pilling Always Pays, rose campion, sculpture, snapdragon, Thomas Armstrong, verbena by derrickjknight. Bookmark the permalink. I enjoyed the stroll. Maintaining a garden is a labour of love. I like those chairs and table. You seem to be getting about well now. I love the way your garden is designed with the paths, resting spots, etc.–as well as the beautiful flowers. Delightful. Your garden perambulations are obviously improving your mobility. The garden is coming along magically, Derrick! Hope you are feeling good today. Progress is being made – slow but steady! The patio set is really attractive! Such a lovely patio set and what a garden!! Slow and steady wins the race. The table is perfection! Your garden is always so beautiful, Derrick. Are campion related to carnations? And I’m always amused by your menu at the end of each post! Thanks very much, Val. The Head Gardener is looking up the answer to your question as I write. Hello Val, you are right, they are a distant relation to carnations, I had to look up the family name of Caryophyllaceae , that divides into Silene and Lychnis, campion is a Lychnis, I have learnt something today! Thanks, Jackie. 🙂 (I love carnations and your flowers there have that same sort of look about them. The garden setting looks perfect in its new home and the garden as always, is a burst of colour and interest. Summer has burst upon the scene! Inspiring walks along the garden paths! I love the bright pink geraniums, especially! Garden maintenance time! All is looking very neat and tidy after Jackie and Aaron’s hard work. The flowers are beautiful and the table and chairs look great on the patio. Very many thanks, Natalie. Jackie aims for all the year round colour. This is, I think, the best time, but it holds out, beyond Autumn, until winter with a few flowering blooms. Your garden is pure joy, Derrick, and I’m mightily impressed that know the names of every plant. And a book that I’ve not read – it sounds rather fun! It sounds just my sort of book, Derrick. It’s added to the interminably long list of books I’d love to read – I just need a few more lifetimes to work my way through it! Watching images from your garden is happiness. Nice that you have such lovely gardens to walk (or hobble around in). Very lovely environment. 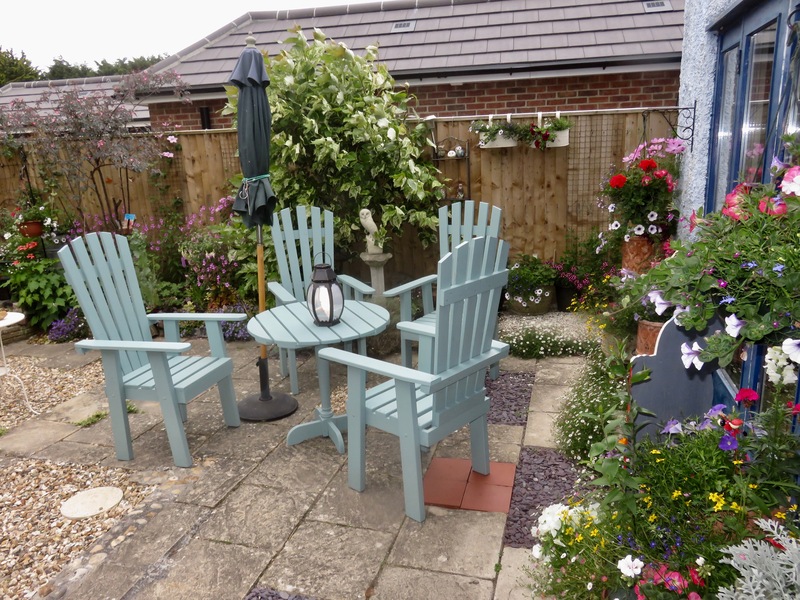 The garden looks great, and what a charming set of chairs and table. Perfect for tea, drinks, or whatever in your oh-so-lovely place. So beautiful!! How enjoyable to be out in your own garden. But the gardener’s worth is all above! I always feel like I’ve come home when I see your beautiful garden photographs – this years flowers are just brilliant, elegant and inviting. It’s a quiet organization of these meandering pathways. Lovely Derrick, hats off to the Head Gardner, Clare and Aaron. I’ve fallen behind, I hope you are mending well and will be up and about joining in gardening. Isn’t that always the way it is – still you are one step ahead of where you were in your recovery last week. Best wishes as you continue the recovery process.